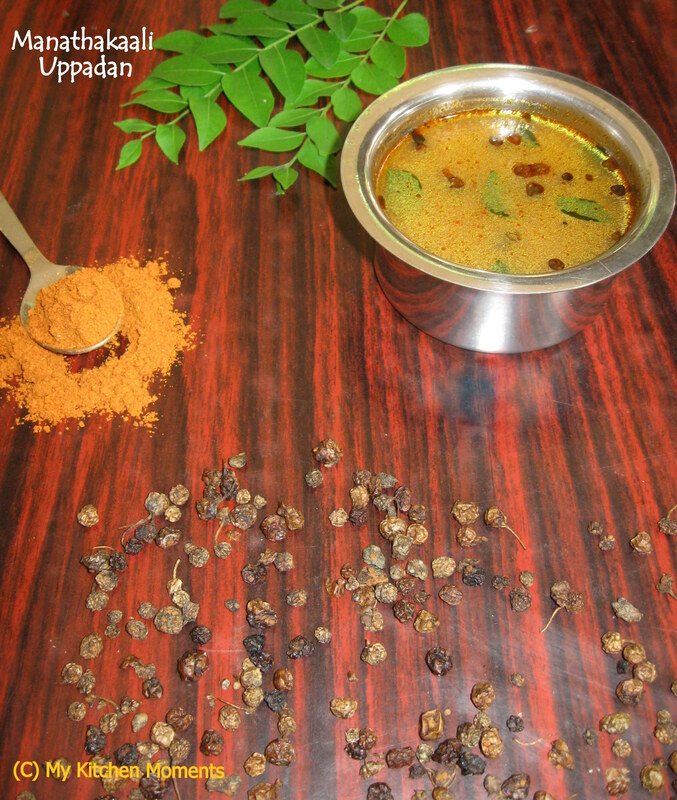 Uppadan is a very traditional Palakkad (Palakkad is a district in Kerala) Brahmin style side dish. It is a very easy to prepare and a classic Palakkadan recipe. Though most of the dishes or recipes from Kerala have the specialty of having coconut in it – coconut either be in the form of shredded coconut which is sauteed and roasted along with a vegetable or else ground coconut in the form of curry or gravies in the dishes. This Uppadan is one such recipe that does NOT require any coconut or dal to prepare it. It is mainly prepared by using just the spice powders. Uppadan is mostly prepared with Manathakkaali vathals, sundakkai vatthal or any kind of vegetables like yellow pumpkin, lady’s finger, brinjal etc. It is one of those side dishes which can be prepared quickly. Such an apt dish which goes well with hot steaming rice with a drizzle of homemade ghee over it. Manathakkali is also known as Black Nightshade. The manathakkaali plant as such is edible, that is the leaves of this plant can be used to make kootu (manathakkali keerai kootu), stir fry or poriyal (manathakkali keerai poriyal) and so on. And the berries of this plant is sun dried to make the manathakkali vatthals. This manathakkaali vatthal is what we are using for preparing the uppadan. The berries are very effective in treating/ curing any digestive and stomach disorders due to the slight bitter taste of the manathakkali. There is a slight difference between uppadan and vatthal kozhambu. Uppadan is less spicy, more watery, no dals or lentils in it and not as thick as the vatthal kozhambu and/ or sambar. But vatthal kozhambu is a very very spicy and thick kozhambu (or gravy), sometimes with little or no dals in it. Soak the tamarind in hot water for some time and extract the pulp. Heat a kadai with a tsp of oil. Add the manathakkaali’s and fry on low heat till it becomes golden brown. Pour in the tamarind extract and add 2 cups of plain water, a pinch of turmeric powder, asafoetida, jaggery, salt to taste and allow it to boil till the raw smell of the tamarind goes. In the meantime, wash and drain the rice. Then heat a small pan, dry roast the rice, that is fry the rice without oil. After the rice is half done, throw in the fenugreek seeds and dried red chillies. Fry till rice turns slightly brown in color and a good aroma of methi seeds wafts around. Cool and grind it into a fine powder. You can also store it and use later. Dissolve this Uppadan spice powder in half a cup of water and add it to the boiling tamarind- manathakkaali concoction. The spice powder acts as a thickening agent. Check the seasoning and the consistency of the uppadan. Check for the salt and adjust accordingly. Once done, remove from heat and keep aside. In a seasoning laddle, add a little coconut oil and heat it. Then season with mustard seeds, fenugreek seeds, curry leaves, coriander leaves and pour over the manathakkaali uppadan. Serve the manathakkaali uppadan with steaming hot rice with a dollop of ghee over it and with some roasted papadam/ papad and or vadam. Normally this uppdan is bit watery. If you want it to be thick, add more uppdan spice powder and adjust the consistency. You can make the same curry with sundakkai vatthal, vegetables like yellow pumpkin, lady’s finger, brinjal etc. I would like to try this…Now I am looking for a packet of dried manathakkali. I love such curries using dried veggies for one silly reason…yeah…being a bit lazy! Love the coconut oil in cooking yaar. Great recipe, will try soon. You add jaggery for manathaki vathal kuzhambu also kya? This is not a typical Vathal kozhambu…. There is a slight variation in its preparation dear…. We were flattered at your authentic South Indian Indian food. May it be ‘Vada Curry’ or ‘Manathakkali Uttappam’ the detailing is all that counts. It’s really hard to resist such relishing Indian recipes. This is an exclusive space for your penmanship, where you can publish your unique culinary outputs in the form of food blogs; that too you’re the one, who’s going to own this space! We would like to pass it on to others by featuring it on our platform! Sulekha.US would be glad to present your food blog to the Indian communities living abroad. We would love to connect them through one of the most vital channels i.e. food. Featuring your interview would be a perk for our eager Indians, who are waiting for Desi recipes and baked goodies ranging from ‘grand’ to ‘on the go’. On the other hand, it’ll be our pleasure to feature your ‘gastronomic talks’ (interview!) on our home page. Sharing your passion for food might rejuvenate the taste buds and senses of millions of Indians living abroad. Thank you Hamida for the lovely opportunity! Yes, i am interested. Please let me know the procedure to take things forward….